I’m on the beach in Deal in Kent in England. It’s a lovely crisp December Thursday and the sea today is extremely calm. So fortunately I can manage to do this without to much wind noise. Hopefully there’s no background noise. Talking about your competitors, yesterday I talked about influencers, getting to know influencers. 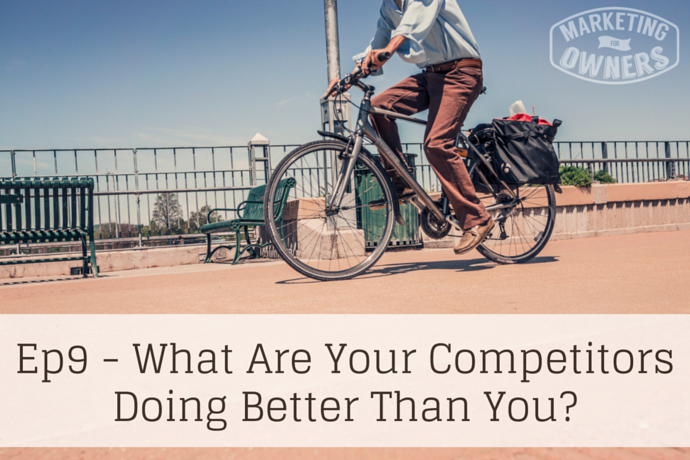 You can call them competitors, you can call them whatever but you’re looking at someone who is doing something better than you. And the reason I say that is because if they’re doing something better, why not emulate it? Why not look at it, add it to your business, add it to the mix, and keep improving? A lot of people would say, when there’s a lot of competitors in an area, it’s not a market to enter. But in actual fact when there are lots competitors it means there’s lots of business to go around. So the opportunity is there to go and look at all competitors, see what they’re doing and cherry pick the best and add it your mix. It’s not too difficult to see what is good and what is bad. In fact you’ve probably come across some of their customers. Ask them what they do well and ask them what they do not so well. And if you see things that you don’t like about your opposition and you seem to be doing the same, stop doing it. Just analyze what’s around you. Don’t live in a bubble. Do what’s good, what’s best practice. Some stuff that works for others will work for you too. Now Thursday is drive time podcast recommendation. Yesterday I mentioned about Chalene Johnson who’s a lovely lady. Now I’m going to suggest you listen to her podcast. It’s called ‘The Chalene Show‘. Until recently she had a second one called ‘Build Your Tribe’ which is more about the things that we talk about. That she’s been overworked and condensed it down to one. In fact if you listen to her back episodes you’ll find out the full story of why she decided to condense it to one. Please get podcasts on your smart phone. Please listen to them when you walk around the supermarket getting your groceries, driving home, driving to work, making your breakfast, and making the dinner. Just make the most of the opportunity to educate yourself and continue to learn. Some podcasts are brilliant and I don’t just mean mine. As usual our podcast is sponsored by the great folks at Rainmaker. Rainmaker will provide you with a wonderful website. You end up doing it yourself but they give you all the teaching within the site to actually make your website work for you. And that’s what you need. So I recommend go have a look. It will fit any business and you can ask me because we use it. Email me, ask me any questions I’ll try and help you out. That’s it for today. One more day of the week and then we’ll have the weekend challenge to give you something to do. So enjoy your Thursday and I’ll see you soon. And, don’t forget to subscribe.